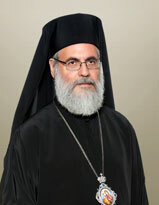 The Eminent Metropolitan Bishop of Ilion, Acharnai and Petroupoli, Mr. Athinagoras (George) Dikaiakos (Assistant Professor at the Postgraduate Program of Theological Studies of University of Neapolis, Paphos) was born in Athens, Greece, in 1951. He earned his Degree in Classic Literature from the School of Philosophy of the National and Kapodistrian University of Athens (ΕΚΠΑ) in 1974 and his Degree in Theology from the Theological School of Aristotle University of Thessaloniki in 1979, both with grade ”Very Good”. During 1984-1985, he attended postgraduate courses in Pastoral Theology in London. In 1998, he attended a two-year postgraduate course at the Theological School of the Aristotle University of Thessaloniki in the field of Christian Ethics and Sociology, where he received his master’s degree with grade “Excellent” in 2002. The subject of his thesis was: “The Pastoral care of widowing, according to St.John Chrysostom, and Modern Psychology”. Meanwhile, in 2000, as part of the Medical School (Psychiatric Clinic) and Theological School (Department of Social Theology – Department of Christian Worship of Education and Training) of ΕΚΠΑ collaboration, the Metropolitan Bishop participated in the “Pastoral Practice and Mental Health” program. It was an Educational Program of Specialization (consisted of 50 teaching hours) that lasted one year, organized by: a) the Department of Psychiatry and Pastoral Care of the Center for Mental Hygiene, b) the Department of Social Theology of ΕΚΠΑ, c) the Hellenic Psychiatric Society (E.Ψ.Ε. ), and d) the Psychiatric Clinic of EKΠΑ. In 2009, he submitted to the Theological School of the Aristotle University of Thessaloniki for his Ph.D. thesis: “The mental exhaustion and alienation of a clergyman”, which was approved with grade “Excellent” in 2010. In 2017 elected Assistant Professor at the Postgraduate Program of Theological Studies of University of Neapolis, Paphos.